Design is our backbone here at Kulture Konnect. Both Jorge and I got our degrees in graphic design and for the first 8 years of the company, we were the sole designers. Needless to say, we do not like to hand over the production and design reins to just anyone. We needed someone in who we saw potential and that someone walked through our doors just over a year ago. Please join us in congratulating Marisa on 1-year of wonderfulness with her Kulture Konnect family! She came to us fresh out of school and eager to work. Over the past year she has grown so much and we expect to see her really develop her design skills year after year. She is so dependable and enjoys learning new techniques. She has become a real asset to the company and we appreciate all that she does. KK: In your opinion, what is the most important aspect of really awesome design? Marisa: In my opinion really awesome design can come from a lot of aspects. I personally think a good design utilizes white space in a perfect balance so it doesn’t come off too “boring” to your client or the audience. The Volkswagen advertisements for example is one of my favorite when it comes to the use of white space. It's best to get your message across as cleanly as you can if it’s to busy it just causes chaos and no one will know where to look. KK: What is your favorite design program to work in? Marisa: When I first started getting into graphic design, my favorite program was illustrator. I HATED Indesign with a fiery passion, I just did not understand it. Now that I’m constantly using Indesign, I love it. I’ve learned a lot of short cuts and neat little things that Indesign can do that I didn’t know a couple of years ago. KK: What made you want to pursue a career in graphic design? Marisa: When I was younger I always looked up to my cousin and his artwork, that’s when I started to take art classes. Fine art classes slowly progressed into taking computer arts in high school and that's when I started to really get into it just learning the basics when it comes to illustrator and photoshop and the very minimum of indesign. Once in college i really learned all that you can do with graphic design and knew this is what I wanted to do. KK: What have you learned so far in the year that you have been working at Kulture Konnect? 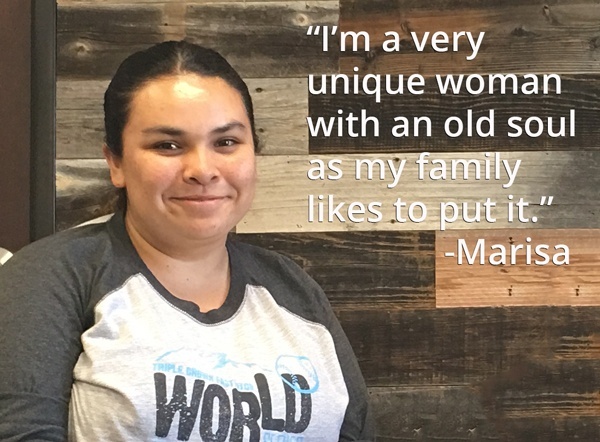 Marisa: What I’ve learned is that I have a lot of room to grow. I was lucky enough in college to have teachers tell you that you’re always going to learn and there's never a point where you stop learning in this career. That’s exactly what I’ve done here at Kulture Konnect. I have learned a lot about the Adobe programs that I did not know before. It has also helped me in the aspect of real life timelines and when projects need to be done, just the whole aspect of working with clients. I’ve also learned a lot about what I am capable of when it comes to being creative. KK: What has been your favorite part of working at Kulture Konnect? Marisa: I really like being able to be a part of the environment and fun atmosphere that Niki and Jorge have built within the company... and over the last year being a part of the growing team. I really loved the office makeover that was done. Marisa: Where do I start? I’m a very unique woman with an old soul as my family likes to put it. As of lately I have learned that I like to mix up or combine my words. For instance, the other day I was having a conversation with my parents and I said “its not like its a game breaker” in terms of someone calling something quits over something instead of “deal breaker”. I had “Game Changer” and "Deal Breaker” in my head and just combined the two. My mother says I get it from my Nana who called Applebees, “the big apple” when suggesting place to take her to lunch. Haha. We are so happy to have Marisa on the Kulture Konnect team and look forward to many more years of working together.